This species is very widespread and stable throughout most of its range and has a wide tolerance of various habitat conditions. 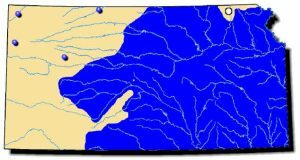 It is found throughout much of the central and lower Mississippian Region; Great Lakes; Southern Atlantic Slope; Peninsular Florida; Gulf Coastal Region, to the lower Rio Grande System into Mexico. The western range extends through Iowa and Missouri to Colorado and western Oklahoma. Comments: As the name implies, the pondhorn is typically found in ponds, small lakes or the pooled headwaters of small streams. It has the unusual capability of going dormant in dry conditions by burying itself deeply in the mud. It can survive exposure to air for up to 578 days at 59° F. To conserve water, it will plug its siphons with mucous. After sufficient rainfall, it will resume life processes by siphoning water over its gills. 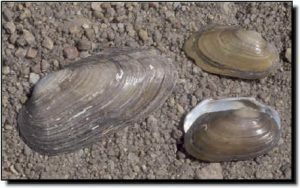 This mussel has a unique distinguishing characteristic: two shallow parallel grooves extending from the umbo area outward to the posterior margin. The color of the periostracum sometimes abruptly changes from yellow to dark brown at a growth-rest line (ring). The shell is relatively smooth but may have a slight ridge where these rest lines are located. Because of its relatively thin shell, the pondhorn is often eaten by muskrats. It is widespread and is one of the few species that can be found in southwest Kansas.